Were your 'Spanish' ancestors European as most Puerto Ricans believe, or African -- North African, to be precise? 1) The indigenous of the Canary Islands -- Guanche -- are genetically Berber, i.e., North African. Berber bloodlines predominate among the people of today's West North Africa (Morocco, Tunisia, Algeria). Spain's Canary Islands lie off the coast of North West Africa and are geographically part of the continent of Africa. Recent genetic studies found a high percentage of Berber (upwards of 72%) mtDNA [direct maternal] lineages among Canary Islanders. 2) Records show the migration of Canary Islanders to Puerto Rico in successive waves beginning with Columbus' 2nd voyage in 1493 and continuing to the Spanish American War, 1898. Actually, the first Guanche to Puerto Rico were brought forcibly as slaves to replace the devastated Tainos. The later waves of Canary Islanders arrived as poor, rural Spanish colonial 'subjects' who migrated to Puerto Rico's agricultural regions in search of a better life. It is their music, food, dialect, community life and olive skins that make-up the "Spanish" component of the island's Jibaro culture. 3) Recent DNA sampling in Puerto Rico found strong evidence of mtDNA matches for Guanche genetics. In some sampled communities 55% of the residents contain the markers, while in others, particularly in the Western portion of the island, it's as high as 82%. 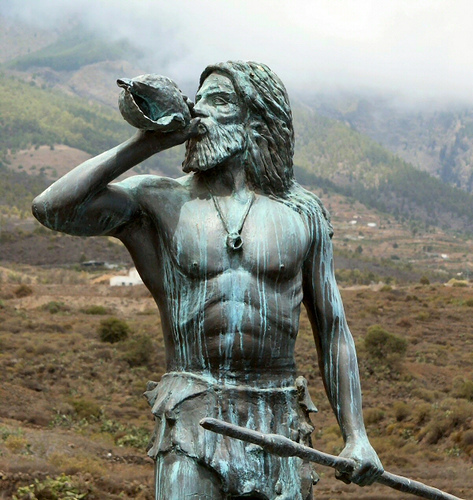 Tinguaro was a Guanche leader who defeated the Spanish conquistadors at a battle in the hills of Acentejo, Island of Tenerife, Canary Islands. The area is now called La Matanza de Acentejo because the Spanish returned and slaughtered all of the local Guanche people.